Chelsea’s late show against Manchester United on Saturday means Arsenal are the only visiting team to Stamford Bridge in the last seven years to win having trailed at half time. 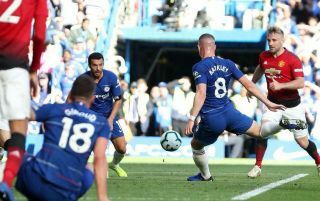 It was a thrilling contest between the Blues and the Red Devils this weekend, with Antonio Rudiger’s header giving Maurizio Sarri’s side a 1-0 lead at the break. Anthony Martial then netted a second half brace to put United on the brink of what would have been a memorable victory, only for Ross Barkley to level things up after a lengthy period of stoppage time. According to Opta Joe, this means it’s still the case that no away team has turned around a half-time deficit at Chelsea’s ground since Arsenal in the 2011/12 season – a run that now extends to 65 games. That day, Chelsea were 2-1 up after the first 45 minutes thanks to goals from Frank Lampard and John Terry either side of a Robin van Persie equaliser. However, the Gunners ran riot in the second half, with Van Persie hitting a hat-trick along with goals from Theo Walcott and Andre Santos. This just goes to show how dominant Chelsea tend to be at home matches, so this struggling United side certainly did well to even come close to collecting three points yesterday. However, it unfortunately maintains a poor record for the Manchester giants in west London, having last won at the Bridge in the 2012/13 campaign.